After a LOOONNGG week of work Jen and I went to the Framing Hanley concert at the Avalon. Walking into the crowded venue was a shock as it is usually a sparsely-filled theater. But the fact that two local radio stations were aiding this concert probably helped to counteract the terrible PR of the Avalon. Arriving we snagged a seat on one of the hard benches toward the back and only had to wait ten minutes for the opening band The Veer Union to begin. Since we didn't show until almost 8 PM I have no clue if others open for the band but The Veer Union was actually okay for a newer band. They had great stage presence. Some of the favorites from this band were the mohawk on the lead singer, the drummer's head shaved on the one side and how it continually fell into his face. The experimental song where band members switched instruments including lead singer and drummer, then the drummer decided to balance a guitar on his chin was highly entertaining. There wasn't any drunk people incidents since it's an all ages venue filled with a lot of underagers (I know that doesn't stop them) but there was the spastic girl freaking out because "The Veer Union Sucked!!!" according to her and she wanted everyone to know it. Finally, Framing Hanley took the stage and they performed the songs from the album well. No really knowing any of their songs except their cover of Lil Wayne's "Lollipop," I was at a disadvantage but I soon enjoyed their other well know singles like "Here Me Now" and "Home". 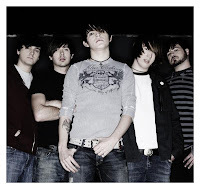 I would definitely recommend the show to those who like Framing Hanley's brand of rock. They are worth the $12 we ended up forking out for the show. Other points to mention are just a couple of tidbits. I was throughly entertained every time the lead singer (Nixon) had to check that his junk wasn't missing, when the band blew a PA and Jen and I thought we'd finally gone deaf from concerts, the high-pitched shrieks from girls in the crowd, and how we had "Lollipop" stuck in our heads as we drove to get Leatherby's after the show. Lollipop is still stuck in my head and I hate to admit it but I'm a little crushing on Nixon... kinda the same way I love Brian Molko. But it was a great concert. I know me too... He's my young crush (like you're crush on Shia). they both have nice pants. BTE in LV was "Juicy"